Meghan Turner-Patel joined the Crystal Peak team in 2017, bringing with her more than 10 years’ experience in marketing and branding. In that time, she has helped launch, fine-tune and grow countless brands. Her expertise includes content strategy and content creation for websites, social media, email marketing, advertising and print. Her extensive writing skills include SEO copywriting and blogging, and she is a published writer in local and national magazines. 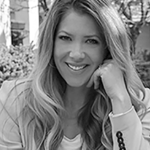 For every Crystal Peak client, Meghan delivers creative, strategic content that exemplifies the brand’s vision and values, while also engaging and delighting its audience.